"Mythbusters" Prove Jack Didn't Have to Die in "Titanic"
Ever since teary-eyed movie-goers left the theater at the end of "Titanic," there has been speculation that both Jack and Rose could have survived by both squeezing onto the floating door. In September, during an interview with IGN, James Cameron thought he put this debate to bed by explaining it was not an issue of space but a question of buoyancy. There was only enough buoyancy for one person, he explained. Well, that may not quite be the case. 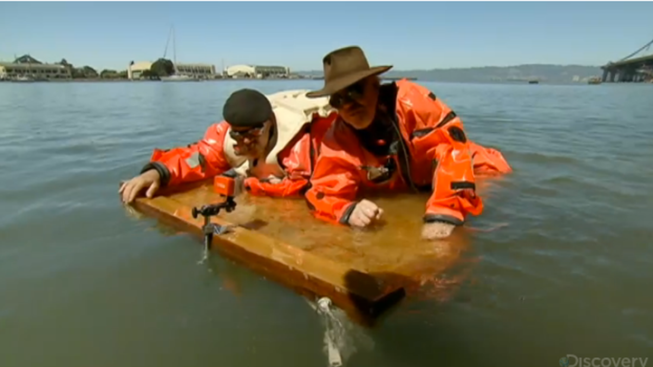 Leave it to San Francisco's own Adam Savage and Jamie Hyneman — aka The Mythbusters — to tackle this long-standing myth. Initially, it seemed Cameron was correct — the duo had a hard time staying on the floating chunk of door at the same time. However, after some MacGuyver-style rigging, they made it work. In the film, Rose is wearing a life jacket. They proved if the life jacket were tied to the bottom of the plank, there was indeed enough buoyancy to keep two people afloat and alive until the rescue boats came, about an hour later. When they presented this news to the "Titanic" director, Cameron said, "I think you guys are missing the point here. The script says Jack dies. He has to die."